Last month, on Halloween, Warner Bros. hit another stumbling block with its Flash movie, as director Rick Famuyiwa stepped aside due to creative differences. As of now, the studio hasn't found a replacement yet, but star Ezra Miller teased earlier this month that the studio still plans on starting production sometime this year. As it turns out, filmmaker Kevin Smith has an idea of who he would like to see direct this movie, Deadpool director Tim Miller. Kevin Smith has just come off directing a new episode of The Flash TV series, along with an episode of Supergirl, which shifted from CBS to The CW this season. Upon returning from his TV directing gigs, the filmmaker appeared on his Fatman on Batman podcast with Marc Bernardin, where the talk eventually turned to The Flash movie. 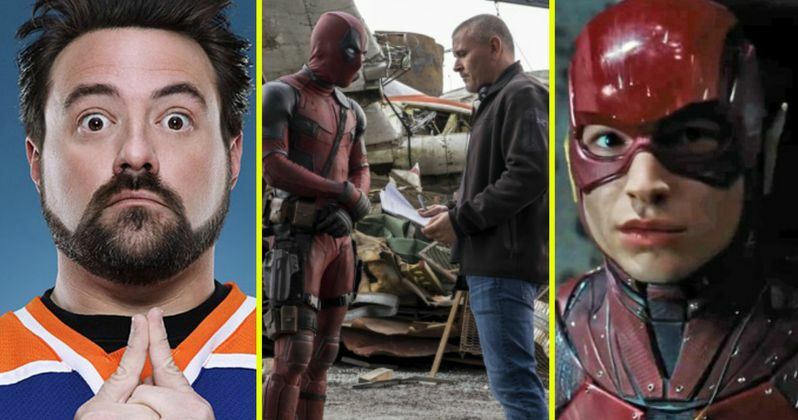 Marc Bernardin goes through various directorial choices for The Flash, but when Marc Bernardin mentions Tim Miller in passing, Kevin Smith calls that choice "accidental genius." As you well know, Tim Miller surprised fans around the world when he walked away from Deadpool 2, after creative differences of his own with the studio and star/producer Ryan Reynolds. It isn't known if the director would even be interested in jumping ship from Marvel to DC Comics, but it could be quite the coup for DC, bringing an up and coming director over to their side of the cinematic superhero spectrum. Regardless of whether or not the filmmaker is interested, the studio needs to find a replacement soon, or else they may be forced to abandon their March 16, 2018 release date. Marc Bernardin also mentions Attack the Block director Joe Cornish and the Wachowski siblings as possible replacements for Rick Famuyiwa, but, naturally, we don't know if those filmmakers are actually being considered by the studio or not. Rick Famuyiwa is the second director to back out of making The Flash, following Seth Grahame-Smith, who was set to write the script from a treatment by Phil Lord and Chris Miller, and make his feature directorial debut. After Seth Grahame-Smith left the project, reports surfaced that the studio wanted a more experienced director for this important superhero project. Ezra Miller is set to star as Barry Allen, having made his DCEU debut in Batman v Superman in two separate cameo appearances, along with another cameo in Suicide Squad. He will return as the speedster in Justice League, which recently wrapped production and his set for release on November 17, 2017. Take a look at the Fatman on Batman full podcast video below, with The Flash talk coming at the 18:30 mark.